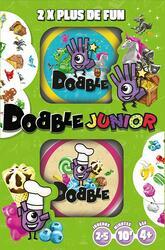 Dobble Junior brings together two game boxes, twice as much fun as a classic box! It includes two complete new products: a Dobble Food and a Dobble Fantasia. So the little gourmets who dream of cakes, ice cream and candy can enjoy themselves while playing! And Dobble Fantasia, whose enchanted and magical world will help children develop their imagination, will become an essential to relive the greatest tales: the gingerbread house, unicorns, fairies and other 7-league boots. Contents of the box : 30 cards in each Dobble.